Google Maps Fun II: It’s the Templars! As I mentioned earlier, I spent a summer working in a summer camp at Floyd Bennett Field. The camp organizer rented huge hangars that were used for makeshift basketball and tennis courts. One of the duties that I had there was cleaning bathrooms in the hangars. Only many years later did I learn how important and historically interesting Floyd Bennett field was. I distinctly remember cool Art Deco aviation wings on the front of the hangars. 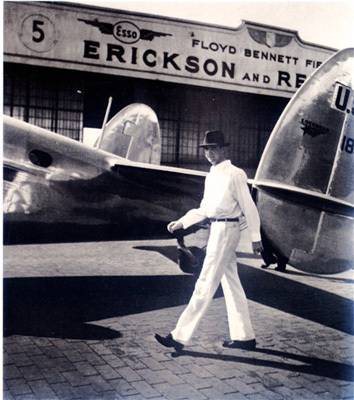 And here’s a nice picture of none other than Howard Huges walking in front of it (very likely the very same hangar in which bathroom I was mopping up poo and pee). 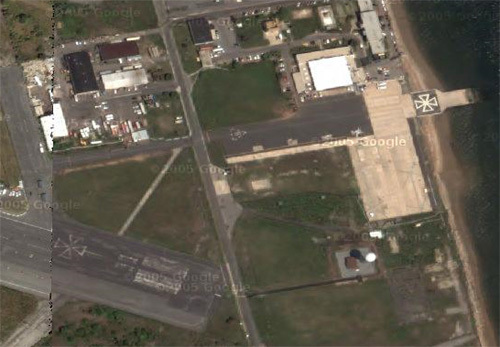 As it turns out Floyd Bennett Field used to be a small, money-loosing airport that had one big draw. It was heavily favored by aviation pioneers as a starting point for world record attempts. It was a starting point for Hughes’s famous around the world in 3 days flight, Douglas “Wrong Way” Corrigan’s transcontinental “wrong way” flight which is a story in itself and numerous other flights by the likes of Alexander de Seversky, Amelia Earhart and Charles Lindbergh. You can find more very cool pictures of the glory years of Floyd Bennett Field here. Of course, not being able to compete with JFK and La Guardia, after the war Floyd Bennett Field airstrips and hangars fell into disrepair, and were used for ventures similar to that summer camp.